Flowers at Paradise, or should I say IN Paradise! 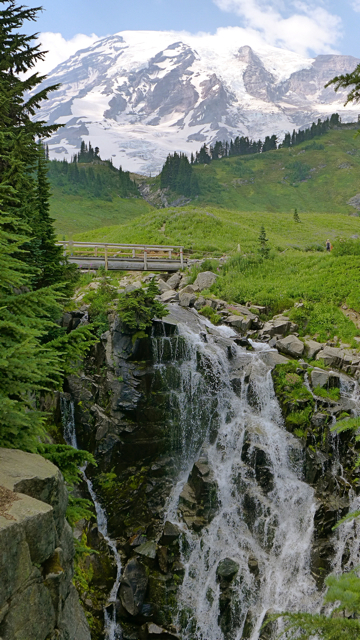 I took a day off from work to explore the panoramas at Rainier that were bursting with color, starting at the Reflection Lake trail and connecting to the Skyline Trail. This is an area I snowshoe, especially on New Year's Day. At that time of year, it is covered with white and lacks contrast. 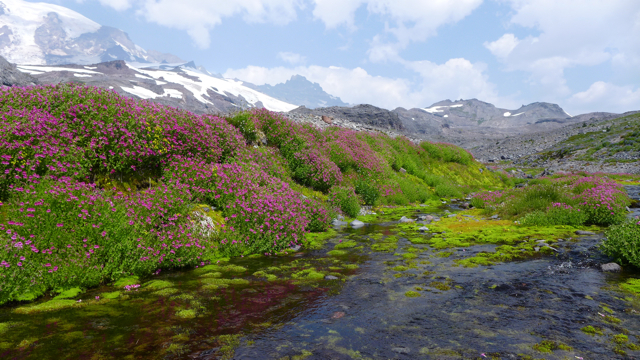 But on this trip, it is an area where the dry of the moraines collide with the wet of the creek and the flowers. The above was taken while crossing the shallow creek, just above Sluiskin Falls. I found a nice rock from which to perch and I filtered water, soaked my feet and took photos. 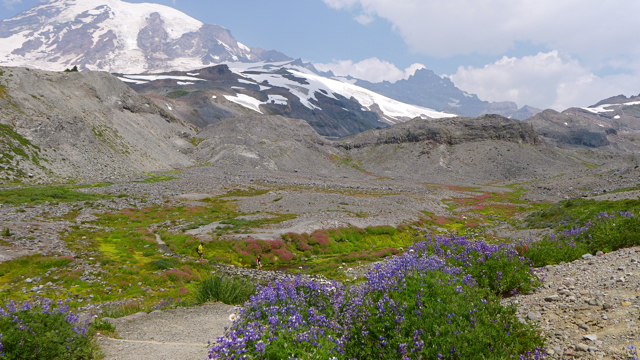 It is so lush with moss and flowers, with a great view of the Mountain, I didn't want to leave. There was lingering snow on the trail to Panorama Point, so I opted for the higher trail. I never expected to find tiny, colorful flowers growing so high (7,000') in a rocky field. This is where I talked to the first of two volunteer rangers and I made a note to self: volunteer at the Park after nursing. 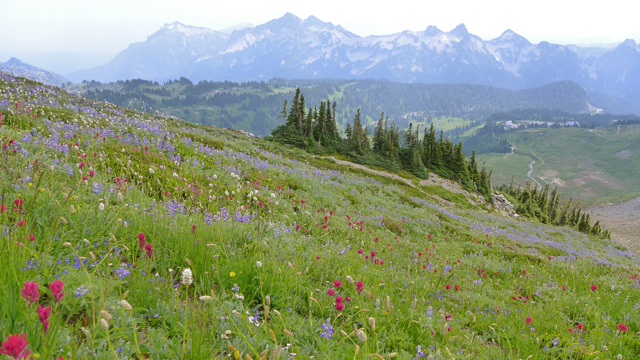 While the Tatoosh Range was hazy, the foreground flowers made up for it. Color, color everywhere! 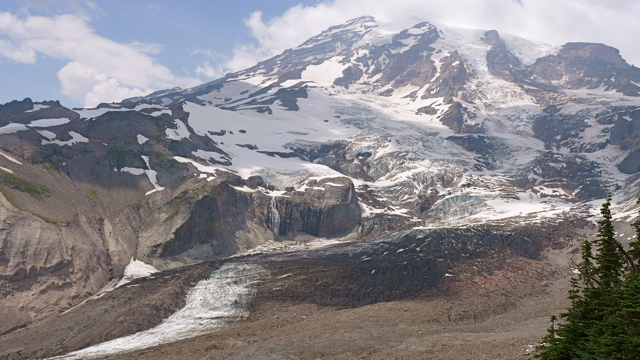 I call this the "Mountain at Work" photo because this is really the heart of Mt Rainier. 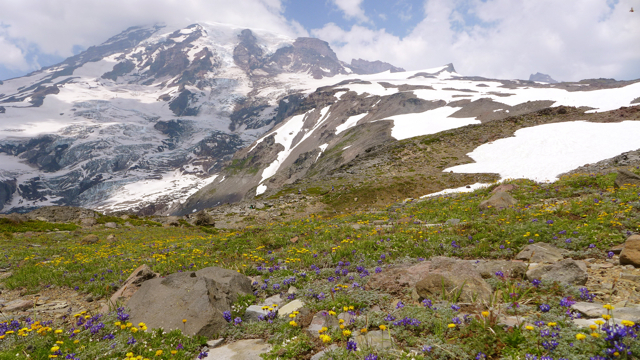 The glacier advances and builds up moraines, moving rocks and boulders as it goes. This is Myrtle Creek Falls and I was the billionth and one person to photograph it. I have a refrigerator magnet with this image painted, only with mountain goats added to the cliff on the left and in the meadow. I was just lucky that the other billion people were not standing on the bridge above the falls at the time. 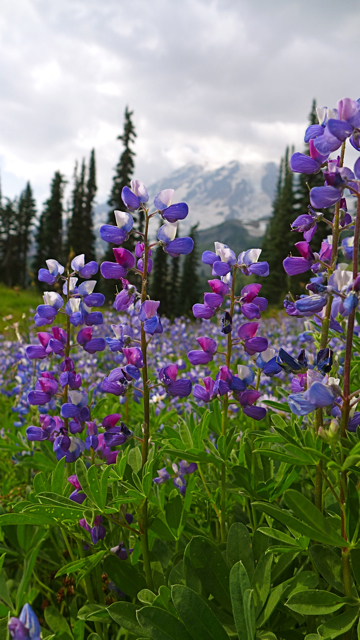 Mountain Lupine is everywhere on the mountain, but these are my favorite colors. I also love the leaf pattern. This was one of the last photos I took and had to return to the trailhead to leave this beautiful area and get back to my real life. Those are incredible pictures of Mt. Rainier! I agree, you should volunteer here and just bask in its beauty.